This dish is a mix of fresh scallops, crab meat, shrimp, salmon and mushrooms. 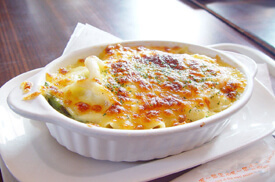 The sauce is made with the cooking juice from the seafood and we’ll serve our casserole with a twist on potato duchess. This class also features a recipe for Chocolate Tart.